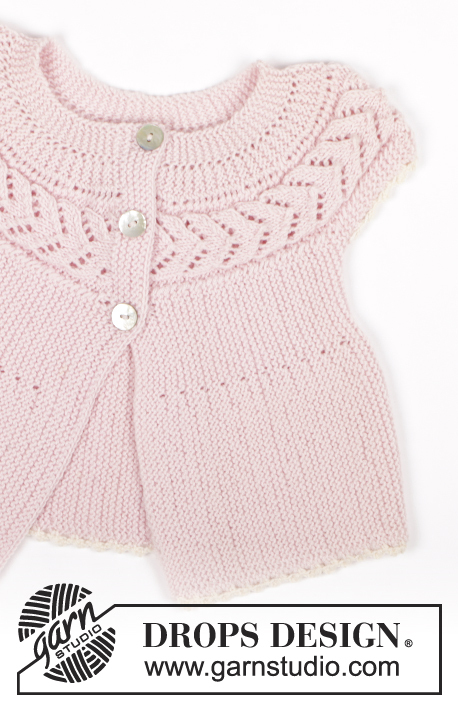 Go to original pattern for design DROPS Baby 20-14. 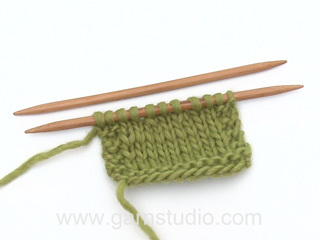 DROPS POINTED NEEDLES size 2.5 mm - or size needed to get 26 sts x 51 rows in garter st = 10 x 10 cm. DROPS CROCHET HOOK size 3 mm – for crochet borders. DROPS MOTHER OF PEARL BUTTONS, no 521: 3 pcs. PATTERN: See diagram M.1. Diagram shows the pattern from RS. 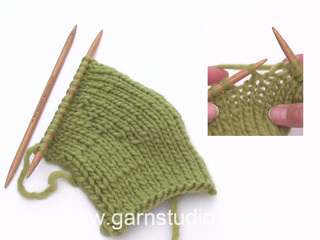 KNITTING TIP: When turning mid piece, slip first st as if to K, tighten thread and work return row in order to avoid a hole in transition. Beg on left front piece and work towards the armhole, work wide shoulder, work back piece, the other shoulder and then right front piece. 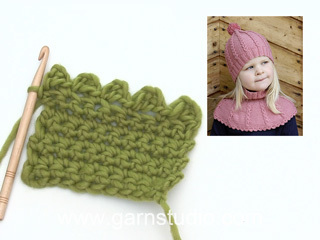 LOOSELY cast on 62-68-78 (88-96) sts on needle size 2.5 mm with light pink and K 8 rows for front band (first row = RS). Work next row as follows from RS: K 41-45-52 (60-65) sts, K the next 15 sts AT THE SAME TIME inc 8 sts evenly (inc 1 st by making 1 YO), K the last 6-8-11 (13-16) sts = 70-76-86 (96-104) sts. K 1 row on all sts (work YO into back of loop to avoid a hole). Continue as follows: K 41-45-52 (60-65) sts (K these sts on all rows), chart M.1 (= 23 sts), K 6-8-11 (13-16) sts (K these sts on all rows). * work the first 30-32-38 (42-47) sts, turn piece and work return row, work the first 46-50-57 (65-70) sts, turn (for all sizes this will be after 5 sts in M.1) and work return row, work the first 64-70-80 (90-98) sts, turn and work return row, work all 70-76-86 (96-104) sts, turn and work return row *, repeat from *-* until piece measures approx 16-18-19 (20,5-22) cm from cast on row, measured where widest (= bottom edge). Now slip the first 41-45-52 (60-65) sts towards bottom edge on a stitch holder (= the side) = 29-31-34 (36-39) sts left on needle for wide shoulder. Continue with shortened rows as follows (first row = from RS): * Work in pattern on the first 23-25-28 (30-33) sts, turn and work return row, work in pattern on all 29-31-34 (36-39) sts, turn and work return row *, repeat from *-* until piece measures 16-17-18 (18-20) cm from where sts were put on stitch holder. Cut the thread. Slip the 41-45-52 (60-65) sts from stitch holder at the side back on needle for back piece and insert a marker in piece. 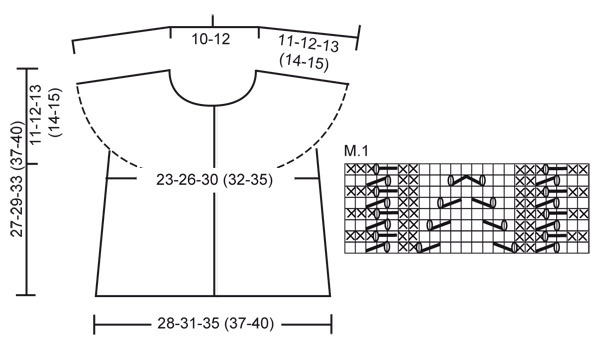 Continue from bottom edge of jacket (first row = RS) in pattern and with shortened rows as described for front piece. work 41-45-52 (60-65) sts, work the next 23 sts AT THE SAME TIME dec 8 sts evenly (dec by K2 tog), work the last 6-8-11 (13-16) sts = 62-68-78 (88-96) sts. Now work front band as follows: K 3 rows on all sts. On next row from RS make 3 buttonholes as follows (i.e. from bottom edge towards the top): K 41-45-53 (61-65) sts, 1 YO, K2 tog, K 7-8-9 (10-12) sts, 1 YO, K2 tog, K 7-8-9 (10-12) sts, 1 YO, K2 tog and finish with K1. Turn and K all sts. K 5 rows on all sts and cast off loosely. 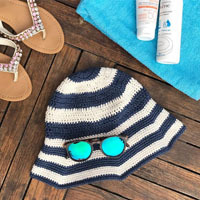 Crochet a border round bottom edge of jacket and round shoulder edges with crochet hook size 3 mm with white as follows: 1 dc, * 3 ch, 1 tr in the first of the 3 ch, skip approx 1 cm, 1 dc *, repeat from *-*. Cut and fasten thread. Buonasera Lelletta. La funzione preferiti verrà ripristinata a breve. Buon lavoro! Liebe Cindy, die verkürzten Reihen werden auch bei den Ärmeln gestrickt, dh wie beschrieben: *2 Reihe über 33 M, 2 Reihe über alle die 39 M* bis die Arbeit 20 cm von den stillgelegten Maschen mißt. Viel Spaß beim stricken! I’m having trouble with the beginning of the pattern. As you start the pattern it says to knit 52 in my case, then M1, then the remaining 11. 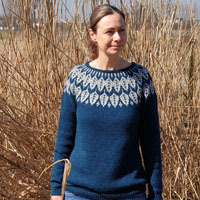 The problem I’m having is that the pattern says AT THE SAME TIME knit 38 and so on. How do you do the first set of instructions and the second AT THE SAME TIME? Do the perhaps mean on the next row or something. Although that wouldn’t work either. Thank you for your help. Dear Kelly, In the first row, you knit 52 sttiches, then M,1 ( keep in mind that you have to increase 8 stiches in M1! ), then the last 11 sts. Then, you K 1 row on all sts (work YO into back of loop to avoid a hole). On the 3rd row, you continue as follows: K 41-45-52 (60-65) sts (K these sts on all rows), chart M.1 (= 23 sts), K 6-8-11 (13-16) sts (K these sts on all rows). This is when you start the shortened rows. 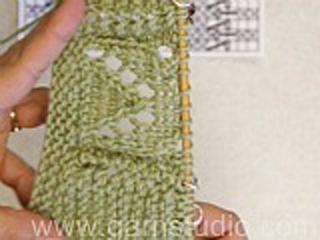 If you never worked shortened rows you recommend that you see the video tutorials that you can find on the left of the pattern. Happy Knitting! Hallo, ich bin Linkshänderin und stricke auch von links nach rechts. In der Regel kann ich strickschriften gut für mich umwandeln. Nur in der Rückreihe von dem Muster weiß ich nicht, wie ich die zwei Maschen in den hinteren Maschenbogen zusammenstricke. Mein Muster sieht dann komisch aus. Habt ihr eine Idee? 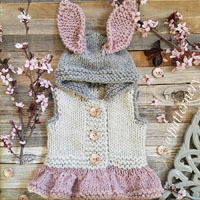 Liebe Melanie, am besten Stricken Sie eine Maschenprobe mit einer kleineren Maschenanzahl, und probieren Sie wie Sie am besten die Rückreihen stricken sollen. Ihr DROPS Laden kann Ihnen auch damit helfen, auch telefonisch oder per Mail. Viel Spaß beim stricken! Jeg strikker baby 20-12 med hulmønster i bunden og ikke som vist i videoen 20-14 Har jeg ret når jeg ikke vender i mønsteret men. Når jeg så har strikke de 16 cm skal jeg klippe garnet og HVAD så nu forstår jeg ikke mere jeg kunne godt tænke mig en video af den overgang hvor jeg også skal slå masker op til ærme. Hej Bente, hvis du strikker Baby 20-12 så skal du følge den opskrift, her er der også vendepinde. Har du flere spørgsmål så skriv det gerne inde på den opskrift du strikker efter husk også at skrive hvilken størrelse du strikker. God fornøjelse! Hei Vivi. Oppskriften til denne jakken er kun i korte ermer, men ta en titt på en annen oppskrift vi har, DROPS Baby 20-12. Dette en lignende jakke med lange ermer. Mulig du greier selv å regne ut hva du må gjøre for å få lange ermer til Baby 20-14. God Fornøyelse! Dette er den yndigste lille trøje. Jeg læste alle spørgsmål og svar igennem før jeg begyndte. Jeg så videoen. Jeg pillede op i begyndelsen og måtte begynde forfra. Efter de første omgange gik det som en leg og jeg er meget tilfreds med resultatet. Liebe Amalthea! Falls du wieder einmal die Kommentare hier anschaut - vielen Dank für deine Beschreibung, ohne die hätte ich das Jäckchen nie stricken können. An alle, die bei dieser Anleitung verzweifeln - lest die Beschreibung von Amalthea und schreibt euch das Muster mit Buchstaben auf ein Blatt, die Vorderansicht = Hinreihe rechts beginnend und die Rückreise links beginnend .So habe ich mir leichter getan. Sorry! Ik zie nu pas jullie mooie filmpje. Ik zal alles maar uithalen.... Het lukt me overigens nauwelijks om de continentale manier van breien te begrijpen. Het 50 jaar geleden geleerde is blijkbaar erg blijven hangen!